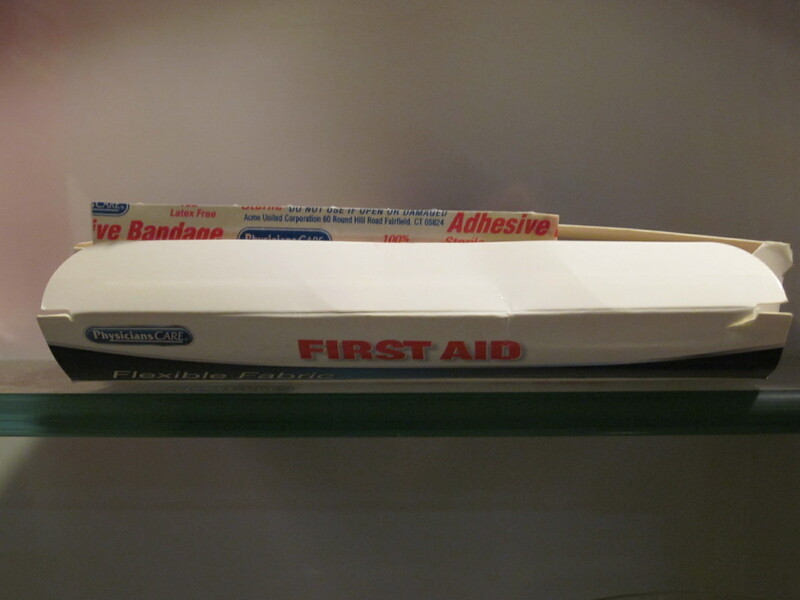 Lame Adventure 154: Fun with First Aid! Me: Where’s a hot flash when I need one? Frustrated, Elsbeth complained to me that her lair, which gets the lion’s share of the heat as Ling and I sit under a vent that blasts us with gusts of arctic air all year long, was feeling much too cold. As this designer’s hand-picked assistant of a mere 54,816 hours, one minor surgery and two invasive medical procedures — but enough digressing about our good times together — I suggested she design a working fireplace and have it installed in her office. My superior settled for donning warmer boots instead. As cold as we were, almost all of us dressed in layers. The one exception was Under Ling, who wore her usual uniform of sneakers, skinny jeans, a tea shirt and a hoodie. Meanwhile, her superior, Ling, sat next to her clad in eleven layers and a scarf. 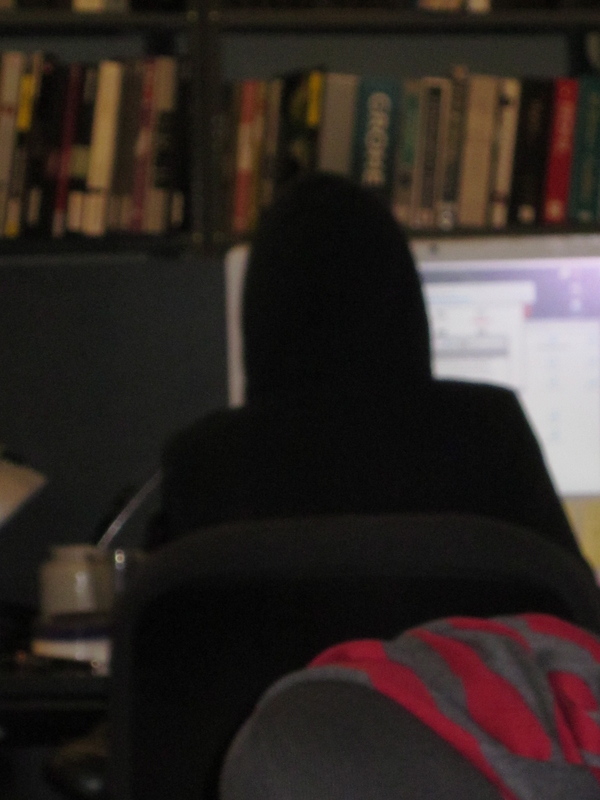 Under Ling, a bolt of fat free energy, sat huddled at her computer shivering under her hoodie. Under Ling: I burned my thumb on a light bulb. What am I supposed to do? I observe a pea-sized brown spot on her thumb. Me: Run it under cold water, dry it, slather it with burn cream, then give me a $25 co-pay. I accept PayPal. We enter the bathroom together. Neither of the two first aid kits has burn cream – or much else. I leave Under Ling in the bathroom where she cools her sore thumb under the tap. I call Rowena, our source for copier supplies, tissues, sarcasm and drugs. She has burn cream. I send Under Ling to Rowena for treatment. Under Ling returns and shows me her treated thumb. Under Ling: I guess it’s a first-degree burn. Me: I’d say it’s more like half a degree. The Quiet Man: How did Under Ling burn her thumb? Greg: She touched me. I’m so hot. The Quiet Man resumes his silence as he departs the premises faintly muttering, “keyhole,” or possibly my semi-deaf ears misheard the exact key word. The next day Under Ling’s thumb is significantly better (and our office about 40 degrees warmer), but this toasted thumb situation troubles Elsbeth. She e-blasts the staff to weigh in about refilling our essentially empty first aid kits. 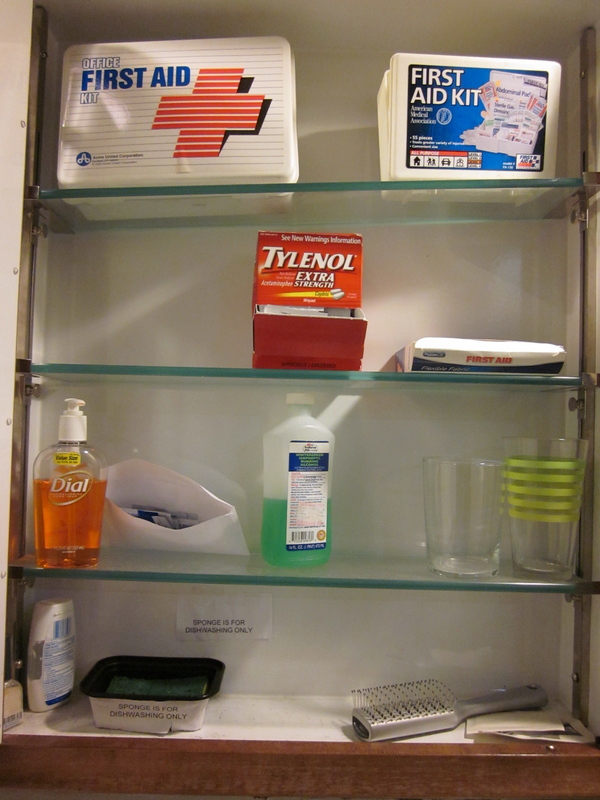 Medicine cabinet with two empty first aid kits. Box with one adhesive bandage. Under Ling suggests bandages, an ice pack and burn cream. 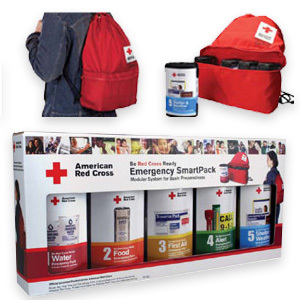 As Greg is writing out his laundry list of ideas, I flip through our office supply catalogue and see the Red Cross Emergency SmartPack. Aside from containing the usual bandages and ointments, this kit is so over-the-top I imagine it even has steroids. "Hey gang, let's hurt ourselves so we can tear into this!" I mention it to my peers. As soon as they hear that it contains food, they start drooling, and when they hear it also has a blanket, a sling (Under Ling wants that) and flares, they’re ecstatic. Yet, this kit costs $51.99. Therefore, Elsbeth dictates that we’re settling for the $21.59 94-piece refill box even though it’s food-less, blanket-less, sling-less, and flare-less. Greg will go to our neighborhood pharmacy to pick up some fresh rubbing alcohol to replace the bottle that’s mint flavored that expired in December 2006. 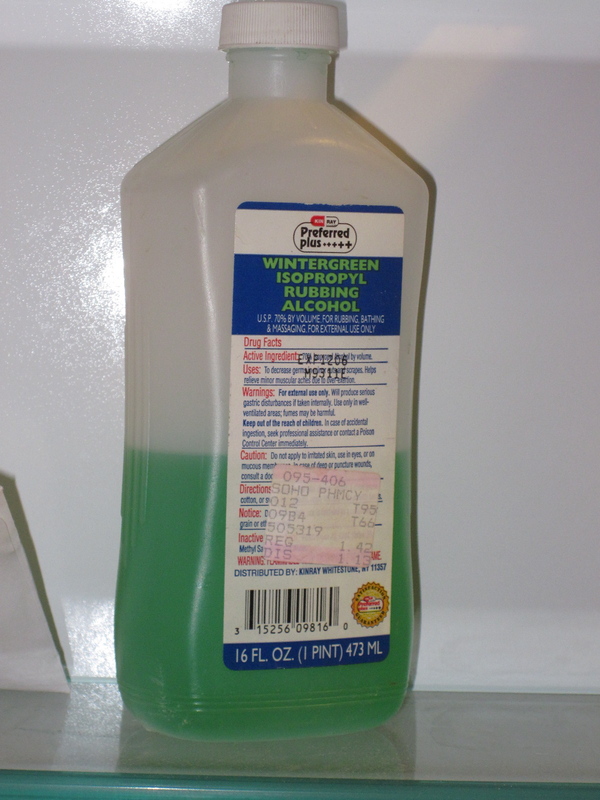 I have no idea why we got mint flavored rubbing alcohol, but it’s possible that some long gone intrepid colleague also used it as mouth wash or improvised mixing a crème de menthe, a cocktail my father used to make for my siblings and I that my sister thinks tastes like Scope. 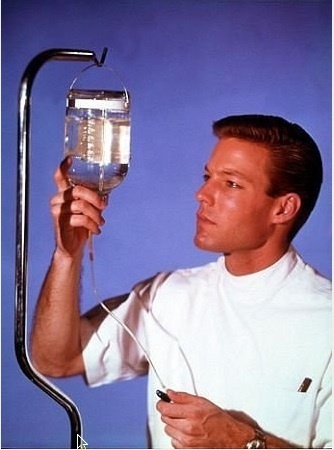 This entry was posted in Humor and tagged first aid kit, medical, rubbing alcohol. Bookmark the permalink.